Jute Hessian Burlap excellent for wrapping the root system of plants or leaf clothes, table cloths. 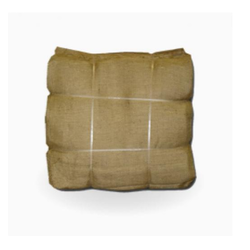 Burlap Squares are mainly available in 7-ounce and the heavier 10-ounce burlap in plain or treated for nursery applications. The cloth is treated with Copper Ammonium Carbonate to prolong life of burlap by slowing degradation process. We are one of the leading manufacturer and supplier of Treated Squares.We obligated to meet the quality standards as per the customer demands.Treated squares are intended for use in the horticultural industry, not recommended for decorative purposes. Treated Burlap Rolls is a superior quality of jute fabric obtained from jute. These are widely used in various industries including packaging and manufacturing industries. With the active support of our robust team, we are engaged in manufacturing and exporting superior quality Treated Burlap Rolls. These are treated in our high-end treatment unit by making use of sophisticated tools and machinery.